Healthcare workers treating West Africa’s Ebola epidemic are having difficulty fighting the disease due to the mistrust of doctors among the members of infected communities. In Guinea and Sierra Leone, where more than 500 people have died from the virus, patients have started hiding from health workers, under the impression that hospitalization is a “death sentence,” Reuters reports. In Guéckédou, a town in southern Guinea, 24 patients with suspected cases of Ebola fled a Médecins Sans Frontières treatment center, and villages in Guinea’s southeast Forest Region have started shutting out medical workers by blocking off roads and bridges. “We are seeing a lot of mistrust, intimidation and hostility from part of the population,” Marc Poncin, emergency coordinator for MSF in Guinea said in an interview with Reuters. In some cases, African communities’ fear of medical workers has escalated to violence. Earlier this month PBS NewsHour’s Jeffrey Brown spoke with Laurie Garrett of the Council on Foreign Relations about various health organizations brought under attack. In Lofa County Liberia, recently, doctors attempting to screen communities for the virus were chased away by villagers wielding knives, swords and stones. UNICEF’S Regional Director for West and Central Africa Manuel Fontaine said doctors must build relationships with African communities in order to gain their trust. “We have to knock on every door, visit every market and spread the word in every church and every mosque,” Fontaine told Reuters. Unsanitary burial rituals have also fueled the Ebola epidemic’s persistence. Many West African communities’ traditional funeral ceremonies involve washing the bodies of the dead, which despite warnings from local and international health organizations, continue to put people in direct contact with the virus. In Sierra Leone, police used tear gas to stop a group from gathering bodies for a family burial. Sierra Leone authorities now instruct citizens to bury the bodies of their relatives in sealed plastic bags. 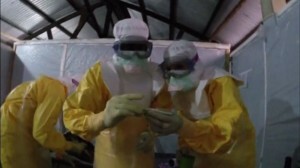 Ebola has infected 888 people and killed 539 since the outbreak began in February. Left: Some patients in West Africa are fleeing and fighting doctors trying to treat Ebola.